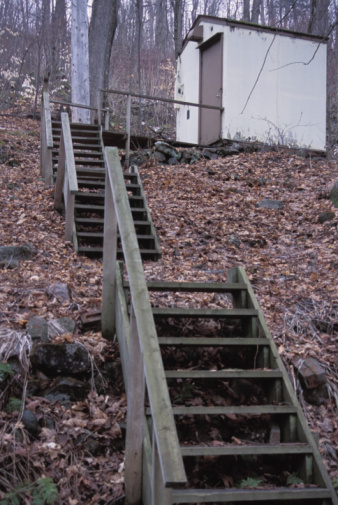 While a fire marshal cannot pass an inspection on a home with concrete block steps, you can still build the block steps on homes under construction or as a temporary stair case while you remodel or build a porch or raised patio outside your home. Building a set of steps from concrete block requires special attention to detail to ensure safety and accuracy. 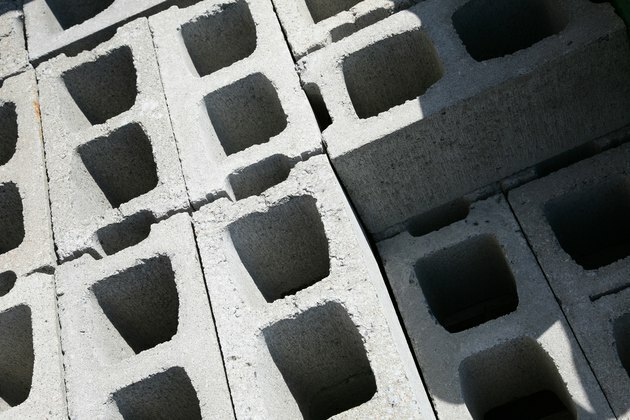 Ideal for temporary steps that you can remove later, concrete block steps generally require less than an hour to build, depending on the size. Measure the distance from the ground straight up to your door threshold or porch opening. This measurement will help you determine the necessary height for your steps, and calculate the outward length of the stairs. Calculate the number of individual steps you will need to span the gap between the threshold and the ground. Multiply the height from the previous step by the intended height of each step. If you are working with blocks that measure 8-by-8-by-16 inches, divide the height by 8 inches. This makes a set of steps with risers measuring approximately 8 inches. Multiply the number of steps you need by 16 inches to determine the length of the stairs and how far out from the threshold you must excavate for the steps. Determine the width of the stairs based on how wide you need the steps so you feel comfortable and safe when you use them. Check the grade of the land with a level before you start excavating. Remove sod from all over the area, then remove additional soil from the high points inside the base of the steps. Check the level before you start digging so you can save time by removing high points as you remove the sod. Tamp the soil down inside the excavated site using a hand-held soil tamper. Check the level of the ground again, remove high points and tamp the ground again until you have a firm, perfectly level step site. Set the first course of block down next to the threshold or porch entrance. Lay the blocks so that the length extends straight out from the threshold. Set the blocks side-by-side the full width of the steps to create a single row of blocks with solid sides facing up. Set another course of blocks over the first layer. This time turn the block to set width-wise in front of the threshold or porch opening; staggering the blocks in this way strengthens the concrete block staircase. Continue adding layers and changing the direction the block face until the top of this first step measures 8 inches or less from the threshold. Continue placing blocks to build up each individual step of the stairway. Stop when you finish a row that requires only one row of block against the ground.